Localized Anime Licensing Killing the Industry? You all know you love your anime and you do what you can to get it, right? Well, most of you know that if you are viewing shows like K-On! with English subtitles, that the fan-subbing done with the series was illegal, correct? Despite the huge popularity world wide for K-On! and some other shows in Japan, there has yet to news of them being licensed for (legal) viewing outside Japan and it almost seems like the licencees simply don't want you to watch them or own their products if you are a gaijin (foreigner). Yes, FUNimation is doing their best to bring many new series here. Even NIS, the guys popular for great anime games just got the rights for Toradora but even THEY can't get some well loved series here...and it ain't all about the money. Being that most anime fans are computer literate, they easily get around the red tape but obviously, the large amount of pirating has also undermined the entire industry, killed entire anime companies and in fact probably prevented even better series from getting to the fans or ever created. Of course there are a large number of series that have been given the go and we can watch on Blu-ray, DVD or for free (legally) on sites like CrunchyRoll, YouTube and Hulu, but the industry seems to not understand how to profit (enough) from the new media paradigm. The pirating is a problem with ALL electronic media in this internet age but to blame the internet trend and the pirating masses is only blaming half the problem. The other half comes from the way anime shows and media content in general are passed around from the creators to the content creators/end-animators and to the licensees. A map of it I believe was done by Anime News Network and I can't help but keep the word, clusterf$^% from leaving my brain. The internet age now lets the people creating content to simply cut out the middleman and getting straight to the fans. This has happened in the music industry, self-made fame on YouTube and recently in anime we have seen it with Cenceroll. This straight-to-all-fans-worldwide marketing scheme is ticking off the old hats of the licensing world by both virally advertising videos to much more fans than the old way of throwing money at an advertiser would and (more importantly) creators are making far more money by ignoring localized licensing rules and just letting their creation go into the wild of the internet. The internet is the great equalizer now; if something is good, it will grow via word of mouth. If it's not worthy, it won't get very far at all. In other words, the success of say an anime, manga series, a music artist or any show in general is based on their talent and the quality of the content and NOT whether a big name is behind them. So, why the large rant, Chuck? Well, as an anime fan, anime site webmaster and anime store owner, I see things both from the view of the fans and from the business point of view. The way shows like the Sailor Moon anniversary DVDs and K-On! figures + shows are being handled, is not very smart business at all. The localization of certain titles is money lost for the content creators, unfair to the fans and only breeding more urge for fans to pirate meida and thus undermining the industry. Notice I don't have ANY K-On! Figma figures for sale? Well, that's because the licensing behind K-On! is so anti-foreign sales that they won't allow the legit stores to sell those figures...if you are an overseas seller. Silly, right? Actually, the licensees told Good Smile Company to not sell K-On! overseas. I got word two weeks ago from the good people over at AAAanime.com that Good Smile Company was forced to limit the amount of K-On! 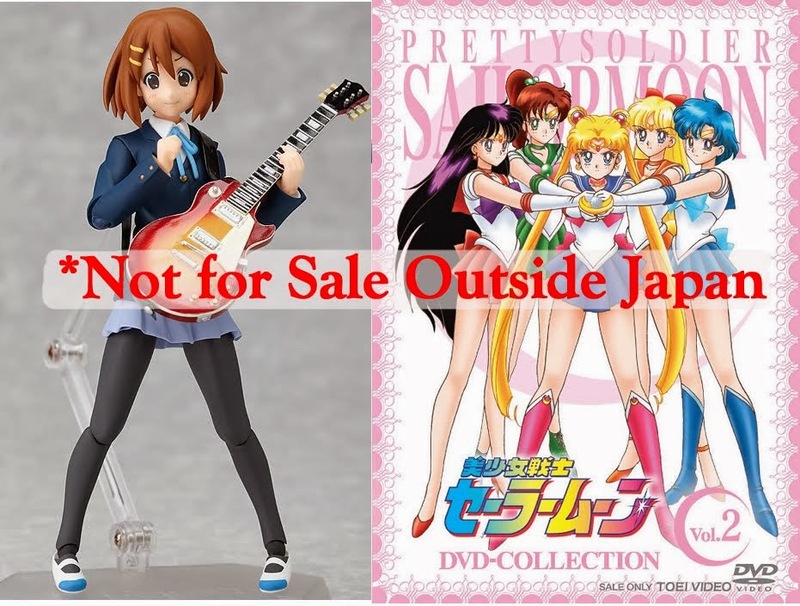 items that go overseas and thus, if you pre-ordered items from a store not in Japan...chances are your K-On! Nendoroids aren't coming (or might simply be fake) To people who bought from me, thankfully all is good, I have increasingly better relations with the wholesalers both in and outside of Japan. I made a formal complaint to the licensees of K-On! about this through AAAanime.com and hopefully something good will come from it. I know you guys want to see all Japan has to offer and I know you'd love to see shows like Sailor Moon and K-On! be on the TV, DVD, Blu-ray block in the states. From a business standpoint, they might not want to allow a series to go to the states and probably fall short, thus losing sales and money but at the very least, K-On! and Sailor Moon (yep still to this day), as well as a few others are $ in the bank for all involved and for us fans...we just want to see them. The demand is there and with demand for content comes sales, business 101. Discuss what you think the anime biz should do to both give us the series we want to see (outside Japan and legally) and to calm down the pirating crazies out there from destroying everything we love about anime.